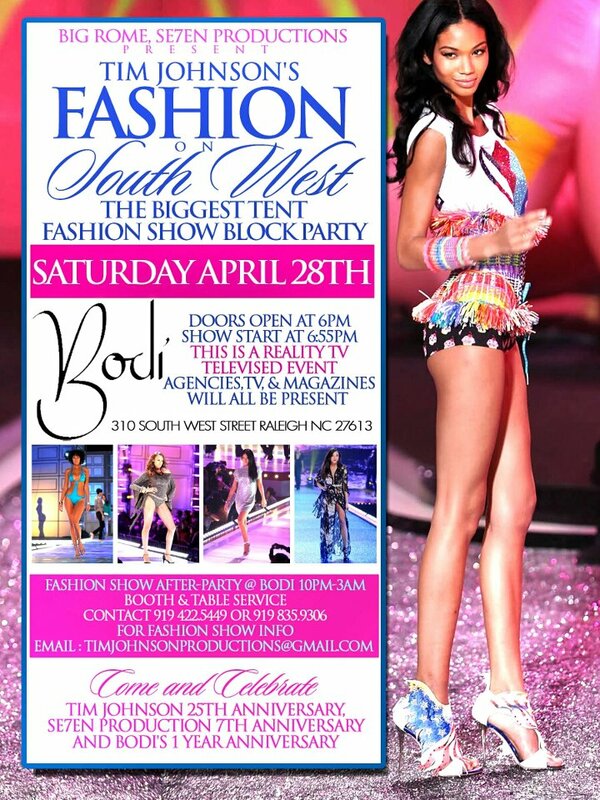 (Raleigh NC- April 28, 2012) Come and celebrate with Tim Johnson, Randall Rome of Club Bodi and Raleigh’s leading entertainment company Seven Productions as they celebrate their business anniversaries in the fashion, nightlife and promotional industries. 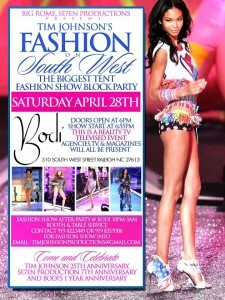 Collectively, they’re producing the biggest fashion show block party to ever hit the city of Raleigh! Raleigh Nightlife is in for a treat. Fashion on South West is a premier tent fashion show created by renowned beauty expert Tim Johnson. His mission is to paint the city of Raleigh with a spectacular event dedicated to fashion and beauty that is sure to leave a lasting impression on the city’s night life. This event will be filmed for a new reality-TV show! The hottest agencies, magazines and notable press will be present so have your dress game on at an all-time high! With more than 24 years of hair and fashion industry expertise, Tim Johnson knows what it takes to pull off the perfect show. Tim is the president and CEO of Tim Johnson Productions & the Executive Director of Fashion Addicts Model Network, which houses extreme training in the areas of Personal Development, Modeling, Makeup artistry, Fashion Design, Hair Styling, and Motivational Speaking in the Beauty Industry. His master level performance as a hair designer, salon owner and fashion event producer is recognized nationally. As the spokesperson for Bronner Brothers, Inc. and Salon Exclusives Hair Care Line, Tim travels internationally facilitating high-publicized events in the beauty industry. Tim has coordinated many events including Women’s Empowerment Fashion Show, The Fashion Take Over & The Battle of the Best Inner Collegiate Fashion Competitions. And Johnson also has been featured as The Trend Release Artist for Pantene Relaxed & Natural, the Spokesperson/Commentator for Bronner Bro. International Hair Show in Atlanta & Former Judge of BET’s Rip the Runway Fashion Show. Randall Rome is no stranger to the nightlife scene. He is recognized as one of the hottest club owners and event manager’s to ever hit the city. Rome is best known for hosting the hottest events at Raleigh’s premier social and corporate venue Bodi Night Club and is responsible for supplying national entertainment acts such as Jim Jones, Lil Kim, Kelly Rowland, Kevin Hart and many more! Bodi features 30 Flat Screen TVs, Private Billiards Room w/bar, Private Theater Room w/projection TV, Two Separate Dance Floors with DJ’s, and a Fruity Frozen Drink Bar. In celebration of Bodi Night Club’s 1 year anniversary, Rome is excited about joining forces to making this block party come to life! SE7EN Productions is an entertainment and lifestyle brand company dedicated to serving the Triangle area with professional promotional services that insures quality results, success, and fulfillment. “Going out of town will no longer be a necessity for quality entertainment,” states CEO Ron Tee. SE7EN Production completes this trinity by celebrating their 7th year anniversary! With SE7EN on board, your company’s event is sure to reach the masses and leave a lasting impression. Vyzion Internet Radio spins worldwide Dj mixes 24/7.